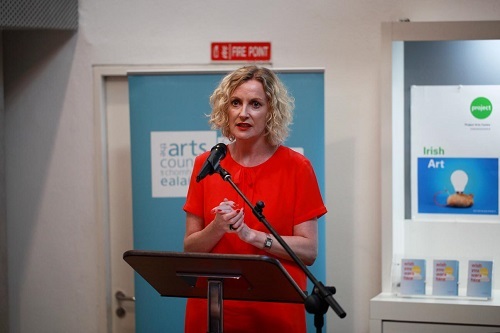 We were delighted to welcome Orlaith McBride, Director of the Arts Council, to Project to speak at our Project 50 season launch. Orlaith very kindly shared her speech with us which you can read here below. I am very honoured to be here this evening to celebrate the phenomenal achievement of Project Arts Centre over 50 years. Fifty years of art, artist and audience. But I’m sure for those who have been part of that 50 year journey it must have been pretty hard at times. So let’s not retrofit an afterglow of applause onto what were I’m sure often episodes of real struggle. History, is not written with hindsight. It is made by those, who driven to do things differently, press on regardless, sometimes in great uncertainty. We should also recall the extraordinary fun we have had here in East Essex Street, and in the myriad places, that Project called home over the years. It’s been exhilarating to see and to be touched by art made in ways that had never been experienced before. At Project, there was always a sense that neither the censorship nor the commodification of culture and the arts could succeed, if they are challenged. It is nearly fifty years since November 1966 when Colm Ó Briain and Jim Fitzgerald organised Project 67. That is key. Fifty years ago, in 1966, the first item on the agenda was 1967. Project from its beginnings was always looking to the future. And the context of 1966 is worth remembering. Then, the state had celebrated the 50th anniversary of the Easter Rising. The revolutionary generation, was passing, but those who still remained were on parade. What fifty years previously in 1916 had been incendiary had become the establishment. It was time, for a new generation to step forward, to challenge old pieties, to insist that the staleness of certainty be challenged by the excitement of experiment. This is Project, this is art; the continual search for new perspective. Project in 1966, shares with the GPO in 1916, one great theme. Neither was possibly big enough to contain all those who subsequently claimed to have taken part in the action. It is a backhanded compliment, to the importance of the cultural combustion which the foundation of Project provided that it is, and has for decades now, been seen as an iconic moment. A moment that marked change. Because the cultural context of Project 50 years ago, was censorship. There was legal censorship of what might be read and there was and continued for a long time afterwards a societal censorship, of what might be said. In taking over the Gate Theatre for three weeks and organising plays, music performances and an art exhibition that featured work by John Behan, Charles Cullen, Michael Kane and John Kelly, Project 67 challenged the prevailing conversation; it disrupted it. Edna O’Brien was invited to address a meeting to protest at the censorship laws. She brought copies of her books, which were then banned in Ireland. Customs officers at Dublin Airport seized them. Actors, including Fionnuala Flanagan and T.P. McKenna, read extracts from O’Brien’s work to a packed gathering, highlighting the absurd situation whereby words that could be freely spoken in public could not be read in private. But within six months the censorship laws were liberalised while, in due course, Project 67 evolved into the Project Arts Centre. In 1974, Project settled here, in the former Dollard Printing Works at East Essex Street. So Project in championing artists and art forms pushed out the boundaries of what an Irish audience could encounter. It was a shelter, a support and a space for experiences and conversations that were outside the norm. Project was a new normal, where difference in perspective was expected. With financial assistance from the Arts Council, Project purchased this site and the early days saw names like Gabriel Byrne, Liam Neeson, U2, The Virgin Prunes and The Boomtown Rats, Nigel Rolfe’s performances, Gay Sweatshop etc etc. What we take for granted now occurred because of a determined effort to push out boundaries and to bring people in. Our sensibility, was shaped and nurtured by Project. The 1980s saw Project become home to Rough Magic , Olwen Fouéré and Roger Doyle formed Operating Theatre during this time. In 1991 Project instigated a programme of redevelopment which culminated in the temporary closure of East Essex Street in 1998 and the sense of improvisation that marked Project was renewed in its temporary home as project@themint above a snooker club in Henry Place, Dublin 1. The first show there was Hit and Run by CoisCéim Dance Theatre. Back in East Essex Street, the Project Arts Centre we know now was inaugurated by Somewhere Near Vada curated by Jaki Irvine under Valerie Connor’s as visual arts director. Paul Johnson’s Mandance performance of Without Hope or Fear was the first performance here. Different sensibilities, new forms of expression, invigorated art forms and the belief that artists could experiment without inhibition, characterised Project. There are neither medals nor pensions for those who founded Project. This is not a home for art as monument. It is not a place of retrospection. It is a laboratory to find the antidote to what afflicts us now. Censorship may be gone off the statute books, but the requirement to challenge consensus, is more pressing than ever. The commodification of the arts and culture is continuous, insidious censorship. Culture does not come as a package. It is not an aid to comfort or complacency. It is much more. Project in 1966, reacted to its time. On its first outing in the Gate Theatre, it metaphorically looked down O’Connell Street, where the parade had passed the year before, and announced a programme of public disorder. The disorder of patterns of thought, of what could be read and said. The disorder caused by innovation in art. That is the essence of Project. It is by being on the edge of conversation, by being truly a resource for different art forms, a place where art can both astonish and rebuke us, that Project is best. Thank you for fifty years of uncertainty and provocation.